In this fast moving era everyone wants information at a very fast rate indeed! Transferring data, content and many other applications in seconds is no more a fantasy as inventions like Bluetooth Dongle keep on flourishing and updating almost daily. 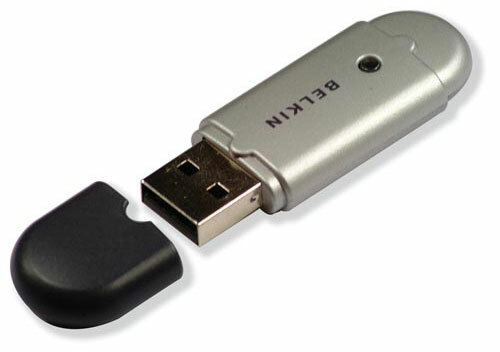 One such dongle device is the beautifully designed Belkin Bluetooth V2.0 USB Adapter. This aesthetically designed piece of dongle is a tiny one but capable of performing that may actually not a cup of tea for even the giant of the devices. Belkin USB Adapter adds tremendous Bluetooth wireless capabilities to your notebook and desktop PC by providing a boost up connection without the complicated wires around you. You can connect with endless Bluetooth enabled devices such as PDA’s, Bluetooth phones and other similar kind of gadgets. All you need to do is simply plug in the Adapter into the USB port of your computer and connect to your cell phones, printers, PDAs, or other computers enabled with Bluetooth technology. By providing connection to various devices it offers you many applications such as easy access to the internet and your email, print documents, transfer files and contact information, and much more. Ideal for home, office and infact any place. Cable-free connections to devised up to 100 metres away. Works easily with Bluetooth v1.1-, 1.2- and 2.0-compliant devices. Fast pairing time (3.5 – 5 seconds). Quick connection times, enhanced voice and multimedia quality, greater Wi-Fi environments, and up to three-times-faster data-transfer speeds are some of the other brilliant features to watch out for in Belkin USB Adapter.